Tired of that common off road buggy look, with ugly body styling representing nothing in particular? Then why not spice up your off road buggy bashing experience with the new HoBao Hyper Cage Buggy. Using the new SS chassis platform the Cage buggy features a complete aluminium roll cage similar to some of todays single seater full size buggies. 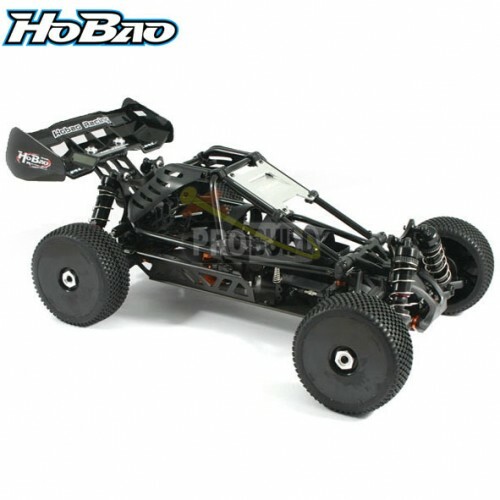 Performance is everything you come to expect from HoBao with the quality and rugged design ideal for the demands of 1/8off road. Despite its complex appearance the lightweight and impact resistant aluminium tubler cage can be hinged forward quickly with the simple removal of four screws providing quick access to the chassis and engine components. As an electric rolling chassis you are free to decide what electronic package is best for you and your budget. Underneath the roll cage you will find a chassis that can accommodate most of todays current crop of high performancebrushless motors, speed controllers and LiPo batteries. The moulded battery tray features three quick release velcro straps perfect for 2S, 3S and 4S packs. Colour coded, anodised aluminium chassis parts complement the roll cage assembly for an eye catching look. The newly designed front C-Hub suspension assembly, 3-differential driveline and 17mm big bore shocks soak up all that is in their path. If you want something different and are looking to stand out from the crowd maybe the solution is the Hyper Cage Buggy Electric. PLEASE NOTE: Requires ESC, Motor, Radio, LiPo battery/charger and AA batteries for completion.